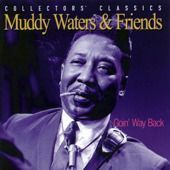 The acoustic-only mode of GOIN' WAY BACK recalls Muddy's similarly constructed FOLKSINGER album. GOIN' WAY BACK doesn't have FOLKSINGER's deep-seated ominousness, but the intimacy and warmth are comparable to that legendary recording. This album was recorded in a single afternoon during a 1967 Canadian tour. In between shows, Muddy and his band gathered in a living room, armed only with acoustic guitars, for a spirited walk through their collective blues memory. An interesting side-note is that legendary pianist Otis Spann is confined exclusively to guitar here, as are the other members of Muddy's group. As always, Muddy's voice is both authoritative and relaxed, and its depth and warmth find a unique resonance in this acoustic company. Hailing from a time when Muddy was prevailed upon to enter into incongruous musical realms in the name of crossover success, GOIN' WAY BACK is a unique, appealing snapshot of the acoustic Delta roots that the Chicago blues godfather never abandoned. Recorded live in The Prince Arthur Street Rooming House, Montreal, Canada in 1967. Includes liner notes by Michael Nerenberg.